The Battle of the Falklands was fought during World War I (1914-1918). The squadrons engaged on December 8, 1914, off the Falkland Islands in the South Atlantic. Following his stunning victory over the British at the Battle of Coronel on November 1, 1914, Admiral Graf Maximilian von Spee turned the German East Asia Squadron for Valparaiso, Chile. Entering port, von Spee was compelled by international law to leave after twenty-four hours and first moved to Mas Afuera before heading to Bahia San Quintin. Assessing his squadron's situation, von Spee found that half his ammunition was expended and that coal was in short supply. Turning south, the East Asia Squadron set a course around Cape Horn and made for Germany. Pausing at Picton Island off Tierra del Fuego, von Spee distributed coal and allowed his men to go ashore to hunt. Departing Picton with the armored cruisers SMS Scharnhorst and SMS Gneisenau, the light cruisers SMS Dresden, SMS Leipzig, and SMS Nurnburg, and three merchant ships, von Spee planned to raid the British base at Port Stanley in the Falklands as he moved north. In Britain, the defeat at Coronel led to a rapid response as First Sea Lord Sir John Fisher assembled a squadron centered on the battlecruisers HMS Invincible and HMS Inflexible to deal with von Spee. 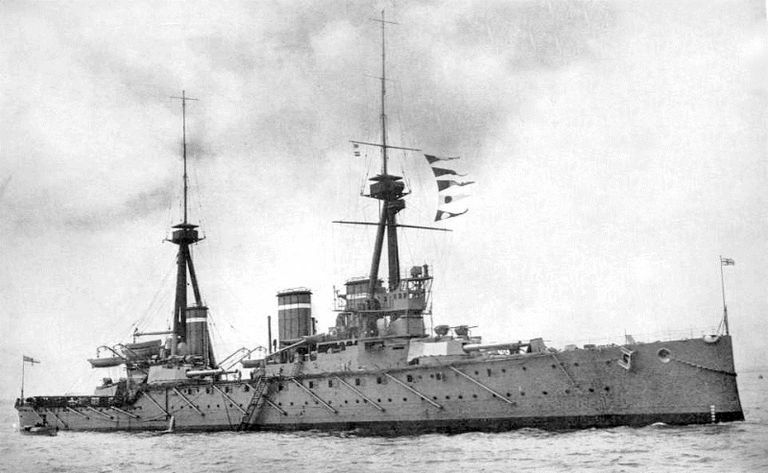 Rendezvousing at the Abrolhos Rocks, the British squadron was led by a rival of Fisher's, Vice Admiral Doveton Sturdee, and consisted of the two battlecruisers, the armored cruisers HMS Carnarvon, HMS Cornwall and HMS Kent, and the light cruisers HMS Bristol and HMS Glasgow. Sailing for the Falklands, they arrived on December 7 and entered the harbor at Port Stanley. While the squadron stood down for repairs, the armed merchant cruiser Macedonia patrolled the harbor. Further support was provided by the old battleship HMS Canopus which had been grounded in the harbor for use as a gun battery. Arriving the next morning, Spee sent Gneisenau and Nurnberg to scout the harbor. As they approached they were surprised by fire from Canopus which was largely hidden from view by a hill. Had Spee pressed his attack at this point, he may have scored a victory as Sturdee's ships were cooling and ill-prepared for battle. Rather, realizing he was badly out-gunned, von Spee broke off and headed for open water around 10:00 AM. Dispatching Kent to track the Germans, Sturdee ordered his ships to raise steam and set out in pursuit. Though von Spee had a 15-mile head start, Sturdee was able to use his battlecruisers' superior speed to run down the tired German ships. Around 1:00, the British opened fire on Leipzig at the end of the German line. Twenty minutes later, von Spee, realizing he could not escape, turned to engage the British with Scharnhorst and Gneisenau in the hope of giving his light cruisers time to flee. Taking advantage of the wind, which caused the funnel smoke from the British ships to obscure the Germans, von Spee succeeded in striking Invincible. Though hit several times, the damage was light due to the ship's heavy armor. Turning away, von Spee again attempted to escape. Detaching three of his cruisers to pursue Nurnberg and Leipzig, Sturdee pressed the attack on Scharnhorst and Gneisenau. Firing full broadsides, the battlecruisers pummeled the two German ships. In an attempt to fight back, von Spee tried to close the range, but to no avail. Scharnhorst was put out of action and sank at 4:17, with von Spee aboard. Gneisenau followed a short time later and sank at 6:02. While the heavy ships were engaging, Kent succeeded in running down and destroying Nurnberg, while Cornwall and Glasgow finished off Leipzig. As the firing ceased, only Dresden succeeded in escaping from the area. The light cruiser evaded the British for three months before finally surrendering off the Juan Fernández Islands on March 14, 1915. For the crew of Glasgow, one of the few surviving British ships that had fought at Coronel, the victory at the Falklands was particularly sweet. With the destruction of von Spee's East Asia Squadron, commerce raiding by warships of the Kaiserliche Marine was effectively ended. In the fighting, Sturdee's squadron suffered ten killed and 19 wounded. For von Spee, casualties numbered 1,817 killed, including the admiral and his two sons, as well as the loss of four ships. In addition, 215 German sailors (mostly from Gneisenau) were rescued and taken prisoner.